The Vitra Home Complements Collection connects iconic designs by designers like George Nelson with creations of younger designers. The Collection includes design objects, home accessories and textiles. Timeless companions for a special atmosphere. Among them are some selected table and wall clocks by the American designer George Nelson. George Nelson worked for the furniture company Herman Miller for several years as creative director. At the same time he developed some exclusive table and wall clocks that embody the lifestyle of the 50s and 60s for the subsidiary Howard Miller Clock Company, which are presented in the Home Complements Collection by Vitra today. 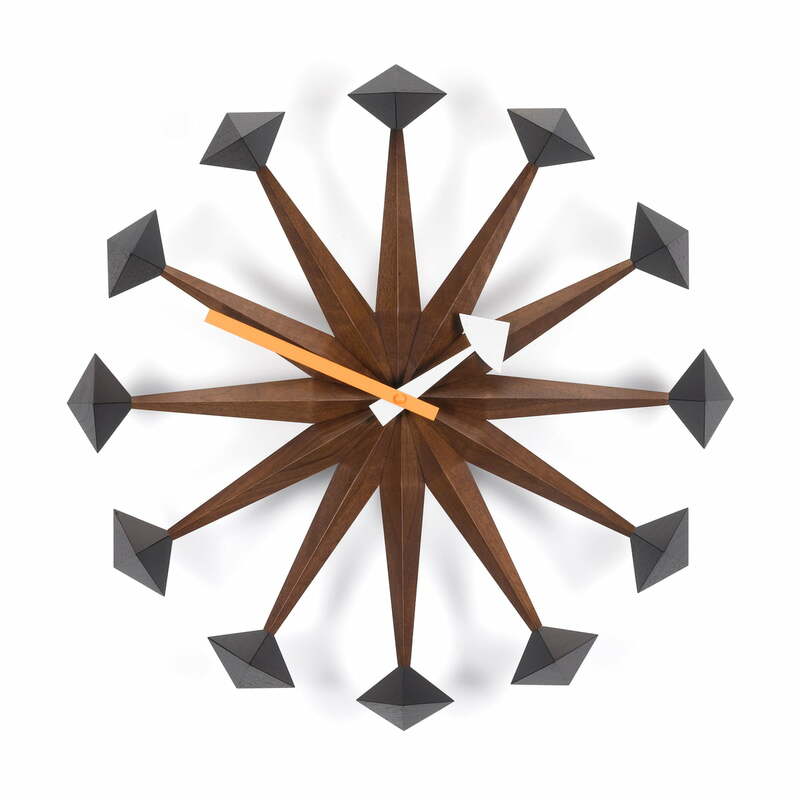 George Nelson's table and wall clocks are characterized by the lack of numbers. According to the designer, the ones who watch a clock concentrate on the position of the pointers. Accordingly, the wall clocks of Nelson convince with an exceptional shape of 12 distinctive dots and coloured pointers, like the Polygon Clock. The sculptural wall clock is a re-edition of 1961, like the original one. It bribes with sophisticated processing of the material and the sculptural shape. The corpus of the special wall clock is made of walnut wood. The white pointer for the hours and the orange one for the minutes are colour accents contrasting the dial and they grant easy readability. All of the Vitra clocks by George Nelson are delivered with high class quartz clockwork and batteries.